To say she divided opinion would be both an understatement and a misrepresentation. In truth public opinion was stacked massively against her but what chance did she have ? They both had the Sun in Cancer but Camilla and Diana had very different Moon signs and by and large it’s the Moon that rules the public responses. 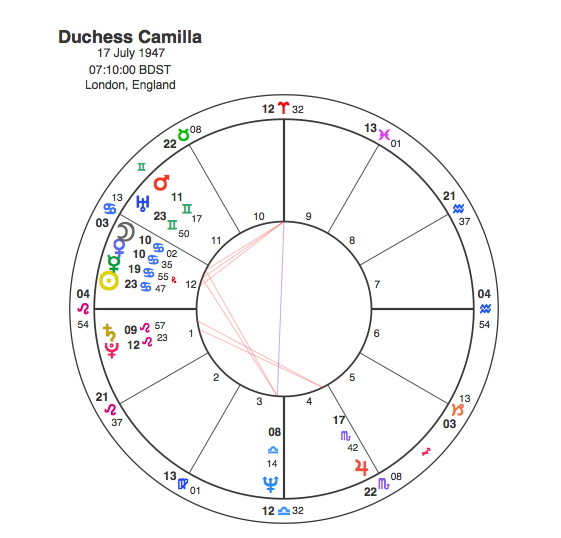 Camilla has an interesting chart with both the Sun and Moon Cancer. Whereas Diana’s Aquarius Moon made her reach out to a global audience and gave her the ability to relate to all kinds of people from different backgrounds, Camilla’s Moon in Cancer made her stay very much with her own people. Cancers particularly those with the Moon in the sign are most comfortable staying at home, like the crab ( Cancer’s symbol ) they will retreat behind a hard protective shell if danger threatens. Camilla’s Cancer group of planets are all in the 12th house and the traditional view of this position is also one of withdrawal and retreat into solitude. Capricorn Research does not entirely agree with this view of the 12th house but it may be that the Moon in the 12th does indicate a reserve and a feeling of insecurity when placed in the media spotlight. Camilla has certainly taken great pains to avoid it and lead her own private life whenever possible. Leo rising is interesting, in some ways she does have the image of royalty and obviously she is married to the heir to the throne but Saturn and Pluto are in conjunction with this Ascendant. One way to read this is to see her Leo Ascendant as the British monarchy itself or at least Camilla’s impact on it. Saturn conjunct Pluto would mean her life would have a powerfully explosive and denigrating affect on the crown. It is always important to say that astrology does not make judgements, good or bad. Most people look for someone to blame when relationship problems occur. Camilla’s role in her affair with Prince Charles made her an easy target for a lot of negativity and many felt she was personally responsible for the whole system of monarchy being undermined and brought into question during the 1990s. Astrology simply shows the themes that have to be expressed and the individuals involved are the means whereby those themes are played out. It’s easy to get the impression that the royals have tremendous advantages and freedoms that money and privilege bestows on them, but in fact people in the public eye have less freedom than the rest of us because every single foible is magnified a hundredfold. Perhaps the greatest advantage to having an understanding of astrology is in the field of personal relationships, because it gives us an opportunity to look at the roles that each person has to play in life and how those themes interact with those of another person. You only have to look at the monumental amount of astrological dating advice that is given to see how significant this is. Many people who would profess to having no interest or time for astrology in any other area of life would be keen to find out their intended date’s Sun sign. The trouble is that Sun sign astrology is of very limited use in relationship planning, the Moon, Ascendant, Venus and Mars have much more to say in these areas. Synastry is the name for the comparison of charts of people in relationship, and the principle is that you take every planet in a person’s chart and look at any aspects they make with every planet of their partner’s. If it was just left to Sun sign astrology, Prince Charles as a Scorpio would be equally compatible with and attracted to both Diana and Camilla as they are both Cancers. 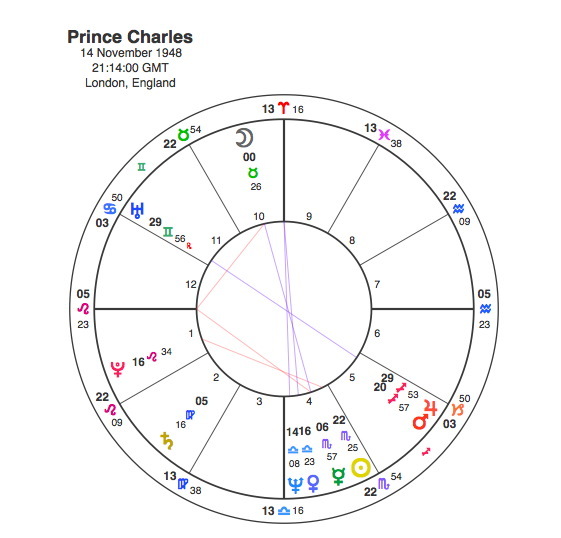 The relationship between Charles and Diana has been covered in a previous article and it has been shown that the main thrust of their charts was in opposite directions despite the fact that they both had the Sun in Water signs. Charles and Camilla however, make a very different combination. Charles’ Sun at 22 degrees 25 Scorpio is in very close trine aspect to Camilla’s Sun at 23.47 Cancer. It is worth noting that Diana’s Sun at 9.40 Cancer is to far away to make an aspect to Charles. This suggests that Charles and Camilla are soul mates and that their own essential paths in life are compatible and would support each other. The aspect between their Suns is only part of it, however. Their Ascendants are both at 5 degrees Leo within half a degree of each other. They are basically in complete agreement about how to lead one’s life. Even their Moon’s are in sympathetic signs ( Taurus and Cancer ). The planets that rule relationships, Venus and Mars are dealing with the same themes but from a slightly different perspective. Charles has Mars and Uranus in opposition, Camilla has these two in the same sign in wide conjunction. The most significant thing is their respective Venus positions. Charles has Venus closely conjunct Neptune in Libra in the 4th house. This would suggest a tendency to idealise relationships and have a powerful need to find the perfect partner. Neptune’s involvement frequently means that one’s search proves illusive and that the ideal is unattainable. It also indicates that his perfect partnership would dissolve and be lost. Its very interesting that this conjunction occurs in the 4th house of family and this points to the reason for this loss, his family just refused to allow it. Camilla also has a close Venus / Neptune aspect, hers is a square. Camilla’s Venus is also square Charles’s Venus. Her Neptune is also conjunct the 4th house cusp. Even more significantly Camilla’s Moon is exactly conjunct her Venus. So Camilla and Charles were always in love but Neptune’s connection meant that it would be frustrated and dispersed. The power of the 4th house and sign, Cancer over their Venus meant that the reasons for these frustrations were to do with family and inheritance. There have been different views on why their relationship ended in 1973. One was that Charles had met Camilla too early, and that he had not asked her to wait for him when he went overseas for military duties. Another claimed that Mountbatten arranged for Charles to be taken overseas to end the relationship with Camilla to make way for an engagement with his granddaughter, Amanda Knatchbull. Some sources also suggested the Queen Mother wanted Charles to marry one of the Spencer family. Other sources also suggest Camilla did not want to marry Charles but instead wanted to marry Parker Bowles. Again others suggested Charles had decided he would not marry until he was thirty years old. In the end Camilla was just not deemed suitable to be a future Queen. The astrology shows that their relationship would inevitably come to an end but the Venus / Neptune contacts would show that the reasons were unclear apart from the fact that the royal family was not keen on it. It ends in 1973 because Uranus was square Camilla’s Sun. According to a number of reports, Charles and Camilla rekindled their romantic relationship in 1979. They became close after the IRA assassinated Lord Mountbatten in August of that year. Charles was said to have been grief-stricken and went to Camilla for solace over his death. Parker Bowles allegedly gave consent to the relationship during their marriage. This time it was Pluto that put an end to their relationship. The turning point in Camilla’s life came in 1981 when Pluto was square her Sun and Charles married Princess Diana. Most people’s view of history was that Camilla was the person that undermined Charles and Diana’s marriage. In fact marriage to Diana was symbolic of the end of Charles and Camilla’s relationship. 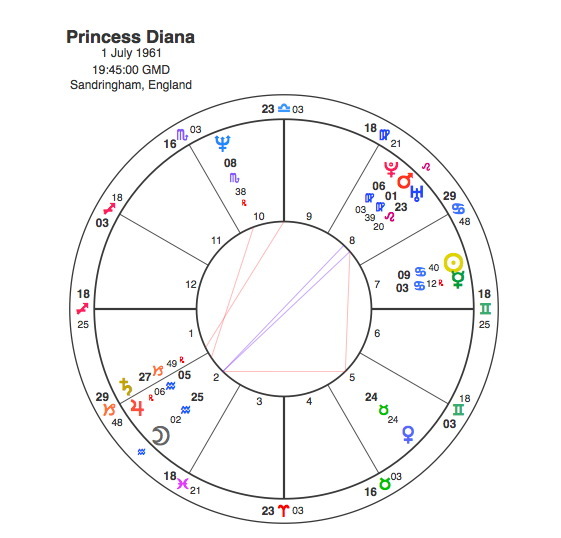 Diana’s Sun is at 9 degrees 40 Cancer, exactly conjunct Camilla’s Moon and Venus and square her Neptune. So Diana is the figure ( Sun ) who symbolises the frustration of Camilla’s love life ( Moon / Venus / Neptune ). Charles confirmed in a televised interview that the relationship between him and Camilla rekindled after his marriage to Diana had “irretrievably broken down” in 1986. Pluto was square Camilla’s Ascendant in 1986. The affair became public knowledge in 1992, followed by the Camillagate scandal, where an intimate telephone conversation between Camilla and Charles was secretly recorded and published in the tabloids. Camilla was constantly attacked in the press. Between 1992 and 1995 both Uranus and Neptune were opposite Camilla’s Sun and Mercury. Of course this is all a long time ago and even the most entrenched public perceptions can change over time. Charles and Camilla married in 2005 when Saturn was conjunct Camilla’s Sun. This might seem like an odd transit for getting married but in many ways it was appropriate. As royal weddings go it was very low key, but it marked the official acceptance of Camilla by the powers that be ( Saturn ). Will we ever see a Queen Camilla ? It still seems unlikely that she would be given that title and she has always said that she doesn’t want it. There is even a question as to whether Charles will ever inherit the throne. The year 1992 was a cataclysmic one for the Royal Family as documented in Pluto and the House of Windsor. Pluto has a powerful impact on the family in general but has been relatively quiet since then. The next few years bring some significant Pluto transits. Both Prince Philip and the Queen have Pluto on their Ascendant and Kate, the Duchess of Cambridge has it transiting both her Sun and Moon. Camilla will have Pluto opposite her Sun in 2020 so many things may have changed by then.